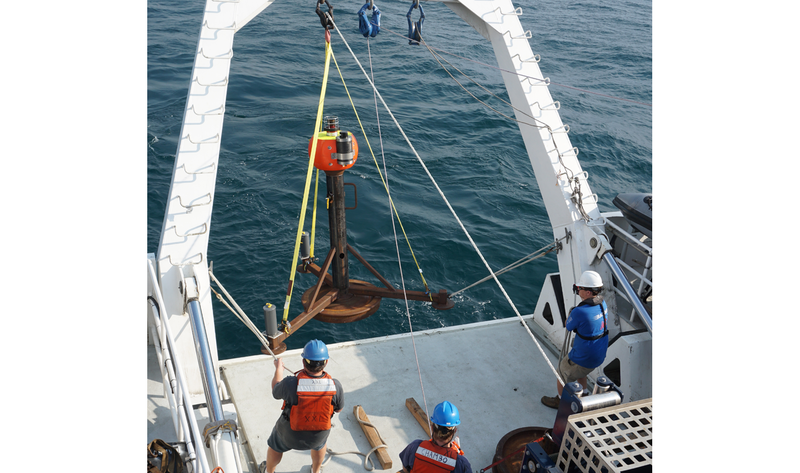 Pictured above: First Mate Paul Ban ties down a tripod frame onboard the R/V Rachel Carson, after it had been buried in a sediment-transport event. Only the rusty orange part was not buried. Just like mudslides on land, sediment flows on the seafloor can wreak havoc. Telecommunications cables and oil pipelines crisscross the deep sea and any large movement can result in millions of dollars’ worth of damage, as it did in 2006 when an earthquake disrupted most of the cables carrying Internet traffic between Asia and the United States. Given the significant economic impacts, geologists have been working to better understand how, why, and how often sediment moves in seafloor canyons. Over the last two years, MBARI Scientist Charlie Paull and his team, along with international collaborators, conducted the Coordinated Canyon Experiment, which harnessed a wide range of advanced technology to break new ground in the study of canyon dynamics. Although geologists have long known about the flow of sediments, both in rivers and on the seafloor, and can infer past activity, this unique experiment offered the opportunity to directly measure the thickness, velocity, and density of the material transported in Monterey Canyon. Sediment flows on the seafloor can lead to serious damage to cables and oil pipelines. This experiment contributed to the understanding of deep-sea canyons and refined the methods to study them. The Coordinated Canyon Experiment was a long time in the making. 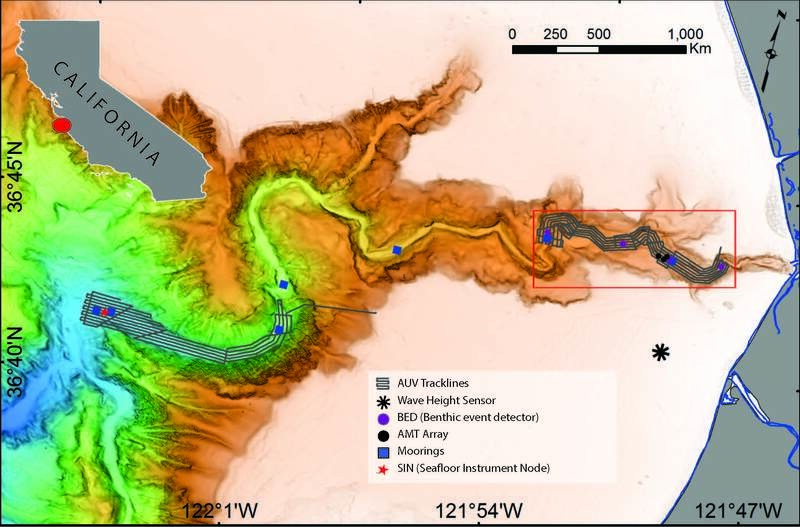 Lessons learned from more than a decade of Paull’s earlier work on the dynamics of Monterey Canyon resulted in the selection of the right location, the correct instrument designs, and the best configurations of sensors for this study. The first effort to characterize the dynamics of sediment flows within the canyon was conducted in 2001. It involved the placement of a cluster of monitoring instruments—originally called benthic instrument nodes and later changed to seafloor instrument nodes—on the canyon floor in 280- and 520-meter (920- and 1,700-foot) water depths. 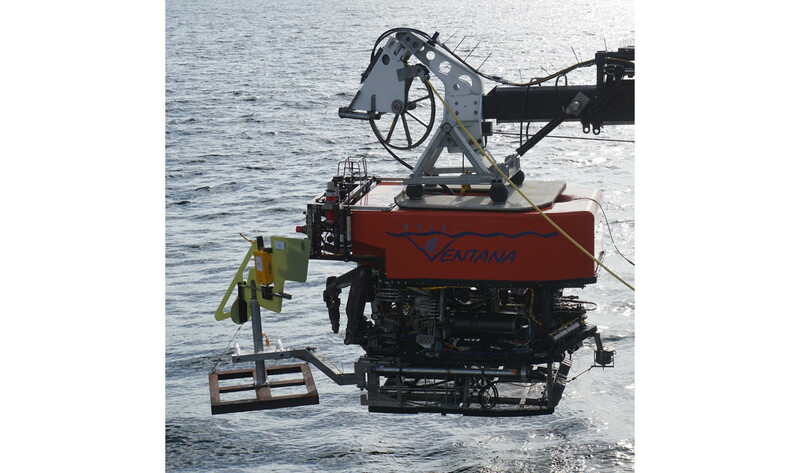 The nodes, a new engineering development at the time, were to be connected together by extension cables laid by a remotely operated vehicle (ROV). 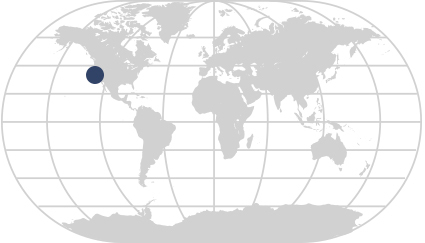 The Coordinated Canyon Experiment was conducted in Monterey Bay, California. However, large sediment flows swept through the experimental sites before the extension cables were laid. One of the nodes placed in the axis of the canyon was never found; the other was found toppled and buried about 180 meters (590 feet) down the canyon. They were originally designed to withstand currents of 16 knots, which is eight meters (26 feet) per second. The large displacements of the heavy instruments attest to the energetic character of the event that tumbled through the canyon. A smaller set of monitoring instruments placed in the same area also moved regularly, making it clear that the upper canyon was very active. While this initial effort showed that powerful events were indeed occurring within the uppermost canyon, this site was deemed too challenging and risky for a monitoring study, at least as initially designed. Nevertheless, despite the loss of equipment, these observations showed that there were sediment flows occurring in Monterey Canyon with enough frequency to enable their study. Next stop: Shepard Meander, a U-shaped curve in Monterey Canyon about 100 kilometers (62 miles) offshore and at a depth of 3,400 meters (11,150 feet), where presumably safer conditions prevailed for the equipment. In 2004, a new system was deployed consisting of a sophisticated sea-surface platform that provided optic communications and power to a seafloor node. 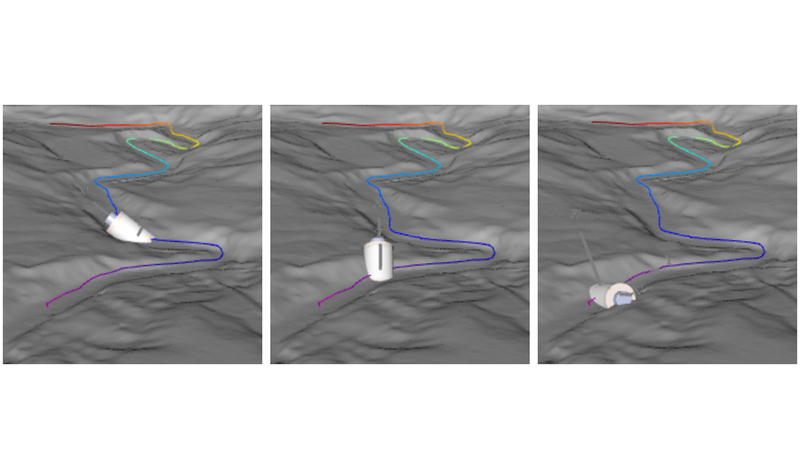 From there extension cables laid by a remotely operated vehicle connected the system to two nodes three kilometers apart, one on the canyon flanks and one in the canyon axis. 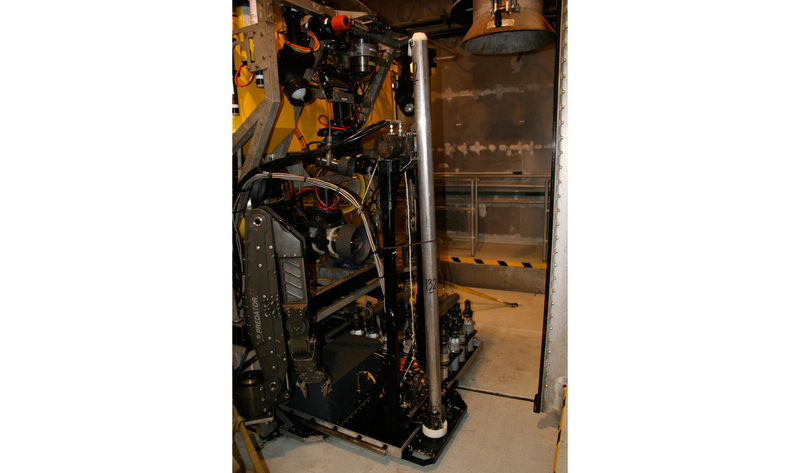 From an engineering perspective, the experiment was a success and proved the performance and utility of the state-of-the-art mooring engineered at MBARI. Unfortunately, from a science perspective, the resulting data set was dull because not a single flow was detected during the three years the monitoring equipment was deployed at Shepard Meander, and no difference was observed between conditions within the axis of the canyon and 300 meters (985 feet) higher on the canyon flanks. However, data collected in the upper canyon by basic sensors showed that sediment flows indeed occurred in the upper canyon during the same period, so the absence of sediment flows in the deeper canyon was significant. It suggested that some flows did not travel the whole length of the canyon, and therefore there must be a better middle-canyon location where a flow-event monitoring study could be conducted. At a mid-canyon site flows would be energetic and representative of a typical turbidity current and could be captured by monitoring equipment, yet instrumentation would be at a much lesser risk of damage than in the upper canyon. Paull and his team determined a better location to study the velocity structure and flow evolution of sediment transport events in the canyon might be at a depth of about 1,850 meters where the canyon widened. As the canyon opened up to the deep seafloor, the energy from turbidity flows would dissipate. Here flows that began in the upper canyon would slow down, so instruments would stand a better chance of surviving and documenting the passage of a sediment transport event. With great effort on the part of MBARI’s science, engineering, and marine operations personnel, the entire system— sea-surface floating platform, anchor node, communications and energy cables, and seafloor instrument packages—were moved from Shepard Meander to the new site at 1,850 meters in 2007. The team nearly completed the redeployment of the system: the platform and main node providing power and communications to the seafloor were redeployed, the instrument nodes were placed on the seafloor in the canyon axis, and a 3.5-kilometer-long extension cable was laid to connect them to the main node. Plugging in the cable to this node was the last step to be completed. This required returning to shore and reconfiguring the ROV. When the team returned two days later and sent the ROV down to complete the system, the water was so turbid the ROV pilots couldn’t see anything on their monitors within 200 meters (650 feet) of the seafloor. This made it impossible to locate the node and connect the extension cable. Apparently, a large flow event, of the type they wanted to study, had just occurred before their return. Although the seafloor infrastructure survived and was ultimately recovered, it was not possible to redeploy the system with the resources available that year. However, a significant finding from the failed redeployment attempt was that the canyon floor at a depth of 1,850 meters was indeed the sweet spot for a canyon experiment—instrumentation at this location would be exposed to energetic flows through the stages of the flow evolution yet the instruments would be capable of withstanding the flows without being swept away. Again, progress was incremental: while the ultimate goal of monitoring a sediment flow was not accomplished, the identification of the right location for a future monitoring study was considered a partial success. MBARI was reticent to shoulder all the resources required for another large canyon study without help. But soon British scientists expressed interest in joining another attempt and were able to engage the British National Environment Research Council to provide funding. In addition, one of Paull’s collaborators at the US Geological Survey (USGS), Jingping Xu, had moved to Ocean University of China, resulting in a commitment by a Chinese research team (as well as USGS) to participate in this large canyon joint study. The project became a multiparty effort with each partner providing expertise, equipment, and/or funding, and agreeing to share the resultant data from the research. Locations where equipment was deployed within the axis of Monterey Canyon and where repeated AUV mapping surveys were conducted during the Coordinated Canyon Experiment. This study, dubbed the Coordinated Canyon Experiment, was far more ambitious and successful than what could have been conceived and achieved by MBARI alone without the collaboration of the USGS and international partners. 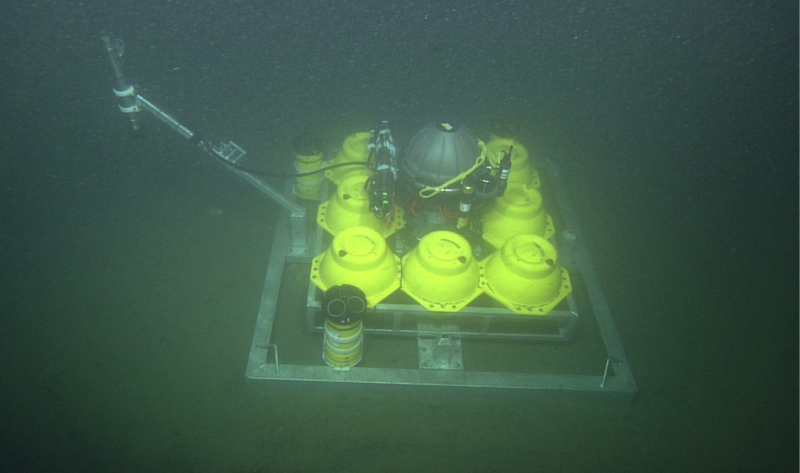 The participation of multiple organizations allowed the researchers to expand the monitoring of sediment flows along the length of the canyon from 300 meters depth to the location of the instrument node at 1,850-meters depth through the deployment of a total of seven oceanographic moorings (see figures above and below), featuring current meter profilers and sediment traps suspended above the seafloor. The USGS and the British National Oceanography Centre provided three moorings placed in the upper canyon, Ocean University of China provided a mooring at 1,450 meters depth, MBARI Scientist Jim Barry had two moorings collecting complementary data at 1,290- and 1,850- meter depths, and the University of Hull (U.K.) supplied additional instruments for the seafloor instrument node. 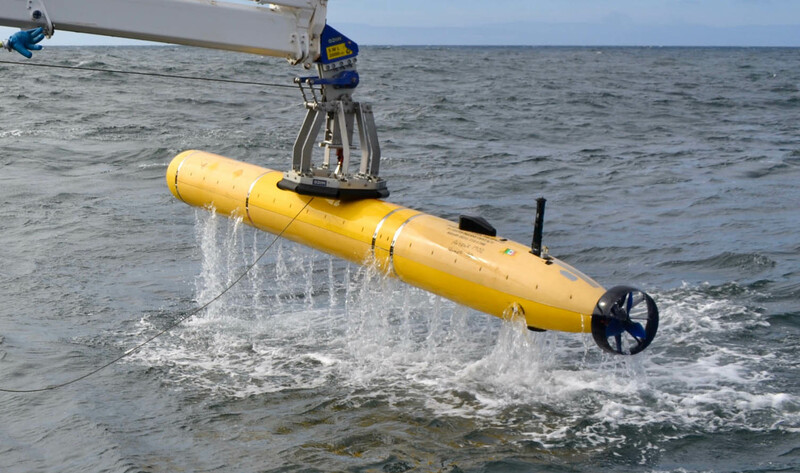 While MBARI provided the ships, remotely operated vehicles, and their crews for deploying and servicing the equipment, the British partners contributed personnel and significant financial support to help cover overall costs. 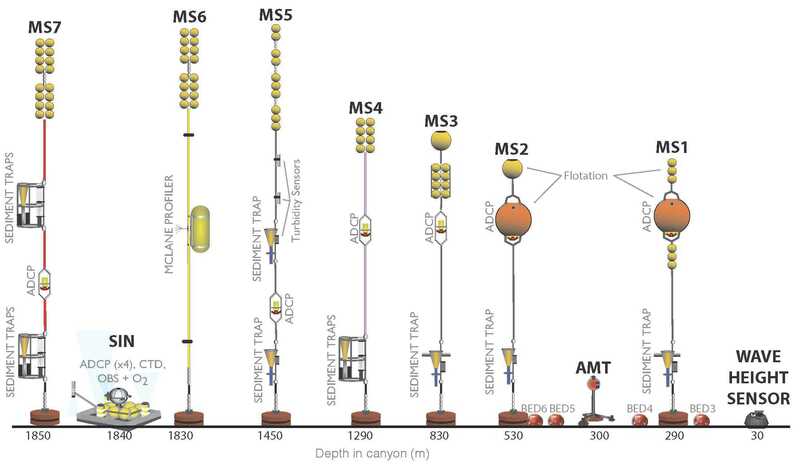 Illustration showing instrumentation deployed at various depths within the axis of Monterey Canyon during the Coordinated Canyon Experiment. MS1 to MS7 are mooring systems; SIN is the seafloor instrument node; BED represents the benthic event detectors; and AMT is the acoustic monitoring transponder. Seafloor instrument node: This seafloor hub contains the electronic “brains” that collected and recorded the highest resolution time-series data of ocean bottom currents. Acoustic current velocity profilers of multiple frequencies placed on the node scanned sediment flows upwards from below—a much different approach from the prevailing method of measuring flows from above, looking down. An experiment of this nature had never before been undertaken at this scale. It embodied risks at both extremes—the seafloor could be so active as to destroy all the equipment or it could be so calm as to provide no meaningful data. The long-term commitment of MBARI to the investigation of the dynamics of sediment flows in submarine canyons was critical for the success of the Coordinated Canyon Experiment. The lessons learned from MBARI’s previous partially successful studies of sediment flows in Monterey Canyon provided the critical information for the right study design and its successful completion. The collaborative effort was key to the methodology, as it involved multiple institutions collaborating in intensive field work: all gear was deployed and recovered in six-month periods, with this process repeated three times during the experiment. The long-term commitment of MBARI to the investigation of the dynamics of sediment flows in submarine canyons was critical for the success of the Coordinated Canyon Experiment. During the 18-month long study, the instruments captured 16 sediment-transport events in Monterey Canyon—all instrumentally documented so that scientists now know what flows look like from actual measurements: their thickness, their velocity structures, the amount of material transported, and how things move on the seafloor. One flow was measured at 8.1 meters per second, a new speed record for measured flows, significantly expanding the velocity range of recorded submarine flow velocities. One instrument that helps record the movement of sediment is the benthic event detector (BED). The electronics package inside a BED is capable of recording not only the speed of its movement, but also the change in orientation as it moves. Software Engineer Mike McCann manually moves the instrument package that will be placed in a BED. In the right panel is the computer representation of the movement and change in orientation. One surprising event during the experiment was the movement of the very large tripod holding the autonomous monitoring transponder 4.6 kilometers down the canyon in less than 40 minutes. It was recovered and re-situated on the seafloor, only to have it swept away again. It was almost completely buried—and moved again even after it was buried! The inescapable conclusion was that the seafloor itself is involved in a flow and that these flows involve movement of sections of the bottom, not just sediment flowing over the bottom—a pretty profound observation. Five benthic event detectors (BEDs) and the autonomous monitoring transponder (gray) moving along the canyon. Distance from the top BED to the bottom BED is approximately 3.6 kilometers. In sections of the seafloor in the upper canyon the mapping AUV detected up to three meters of change as the seafloor grew and eroded several times a year. 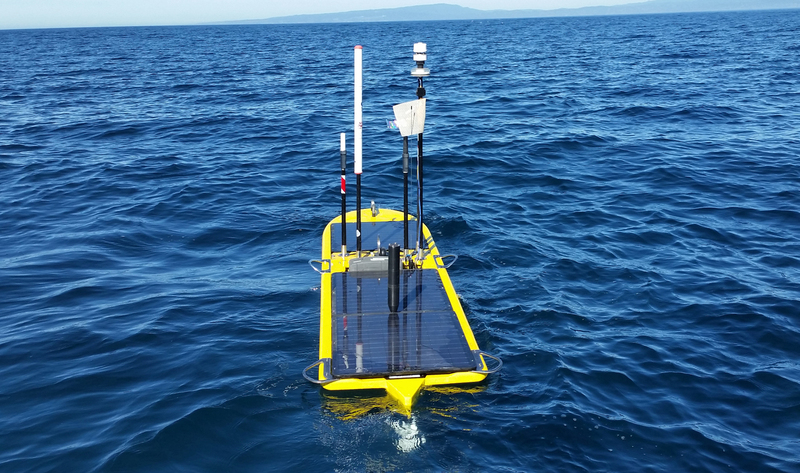 Newer seafloor mapping capabilities, which were prototyped during the study and are currently being refined at MBARI, provided seafloor maps with a five-centimeter resolution around the seafloor instrument node. For researchers, the ability to integrate a quantified morphologic change with quantified energies and flow structures represents the missing link in earlier flows and sediment deposit studies. It points to a new and necessary direction to investigate the genesis of marine geological deposits. Paull considers repeat mapping to be one of the most important advances in marine geology. It may essentially change geology from a forensic science that reconstructs environmental conditions via inference to one based on causal links empirically established between actual observations of physical characteristics of flows and the type of deposits these leave behind. This experiment has more than doubled the amount of information directly obtained from sediment transport events; prior to this experiment, physical measurements of only 10 sediment flows were ever recorded. This new data set will be of value to marine geologists for years to come. The scientists learned that in Monterey Canyon these flows were not triggered by earthquakes or river floods, though they may be weakly correlated with days of big waves. The researchers also determined that these events are initiated by small, random disturbances of the canyon floor—a departure from the geologic literature that suggests they are caused by large external events. An understanding of the dynamic nature of submarine canyons and the causes of these large changes in the seafloor structure has significant economic impacts. These flows have proven to damage communications cables, and necessarily impact the placement and protection of oil and gas infrastructure on the seafloor around the world. As long as such ventures continue on the seafloor, such information will help manage these operations as safely as possible with minimal harm. From a biological research perspective, scientists are also interested in the transport of organic carbon by these sediment flows and its supply to the deep sea. Data from this experiment can help quantify the contribution of large pulses of food matter carried though submarine canyons to life on the deep seafloor. The Coordinated Canyon Experiment illustrates the magnitude of endeavors possible when building upon a long-term institutional commitment to a research area, and technology developments over the course of almost two decades, coupled with the collaboration of institutions and colleagues from around the world. No single research group could have pulled it off, but together they have greatly impacted the understanding of deep-sea canyons as well as refined the methods to study them. 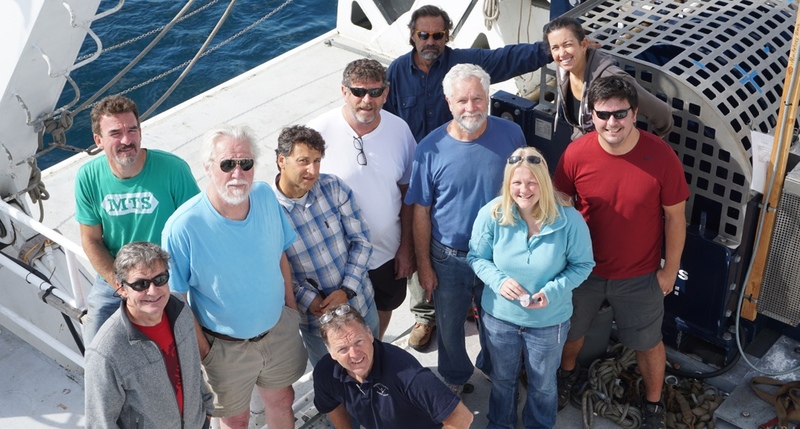 The seagoing members of the Coordinated Canyon Experiment aboard the research vessel Western Flyer in 2015. From left: Chris Lovera, Tom O’Reilly, Patrick Whaling, Roberto Gwiazda, Mark Chaffey, Kurt Buck, Larry Bird, Charles Paull, Esther Sumner, Eve Lundsten, Dan Parsons. Environmental Sample Processor proves helpful in testing for amoebae that may cause brain damage in humans.